As I wasn’t around to do update #5, here are February and March’s updates rolled into one. 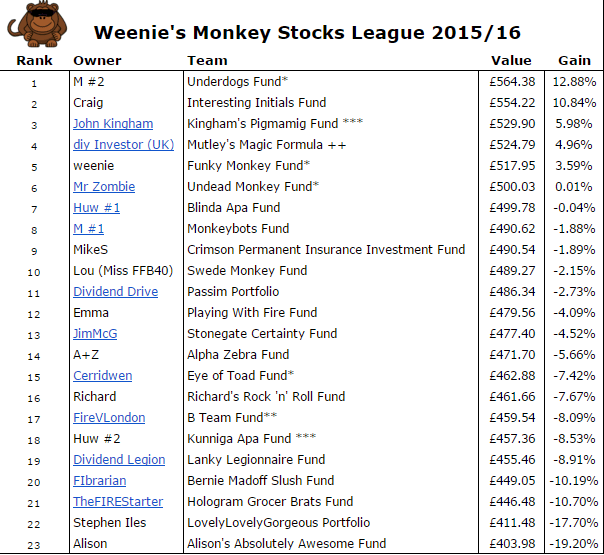 So how’s it looking in the Monkey Stocks League Challenge at the halfway stage? Below is snapshot as at the close of trading 31st March 2016 and leading the charge was M‘s Underdogs Fund! A nice turnaround since the Underdogs Fund was sitting in 16th place at the end of January! All February and March dividends have been added to the respective portfolios. However, please let me know if I’ve missed any (or if there are any errors) as there are so many to keep track of. My own Funky Monkey Fund and Mr Z’s Undead Monkey Fund are still up there. Cerridwen’s Eye of Toad fund and FireVLondon’s B Team Fund not faring so well in the bottom half of the table. John Kingham’s Pigmamig Fund continues to shake its expert stick at the monkeys (and dogs) at the top, while Huw’s expert picks (Kunniga Apa Fund) languish in 19th place. The worst 5 performing shares were Standard Chartered plc, Restaurant Group, Barclays plc, Nostrum Oil & Gas plc and Poundland Group plc. 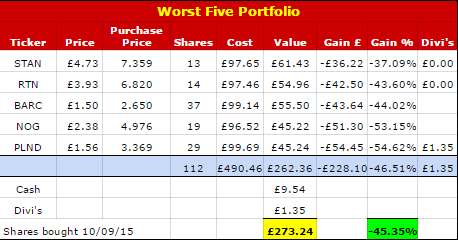 If you’d had the misfortune to pick this lot, you would have seen your portfolio value drop -45.35%! Interesting to see how this is all playing out now weenie. I bet you’re really glad you did it! Although not so interesting is my current league position, haha. Good job I didn’t pick my own as they’d have no doubt been worse. Only 6 in profit but not so surprising given market conditions. In fact I’m quite impressed that 2 have made a double digit gain and even more cool is the best of the best. But that is probably about as likely as picking the super 6 scorelines on the Saturday football! Cheers for the updates as usual! Glad you’re enjoying these updates and yes, I am glad I set up this league experiment as it’s interesting just to see how the shares react to the markets, news etc. The best of the best portfolio is awesome – oh to have a crystal ball to have picked those haha! You’ve just reminded me of how much money I lost during my gambling days on Super 6! What a mug I was, haha! 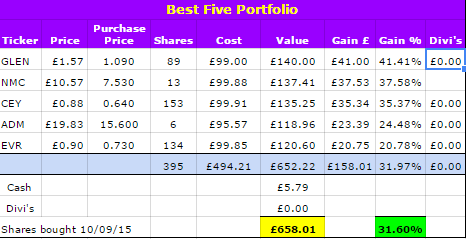 I hope STAN improve too seeing as I have a stake in my normal portfolio – I held onto mine grimly haha! As I said to TFS, am enjoying running this and let’s see if you’re still ‘top dog’ next month! I’ve made 3p. Sweet 🙂 @TFS nice of you to include me in the profit making ones. Just. Scraped. By. Fun experiment so far Weenie :D. Come on undead monkeys. £18 to catch up with Weenie. Focus my good stocks. FOCUS. Anything can happen over the next 6 months – Brexit vote in the summer is one thing that is likely to cause a few waves! The fund called ‘Mutley’s Magic Formula’ is (virtually) made up of units in the Vanguard LifeStrategy 60% fund so is probably the one which we should have put our real cash in! It’s been holding pretty steady in the top 5 for a while, showing very little fluctuation, compared to some of the other portfolios. But you’re right, looking at the list right now, most people would have been better off investing in a Vanguard tracker!